New Members welcome - Enquiries. Green highlight = Molly attending.. . . .White = TBC . . . . . .Yellow = Non-Molly events. . . . Grey = Date unknown. . . . Click here to open full in new window. December 2018 - Boxing Day - Annual Mince-Pie Meet on Mill Meadows. (Past events - 2013, 2011, 2010, & others). 2nd January 2019 - Whalers' Annual "Ice-breaker". 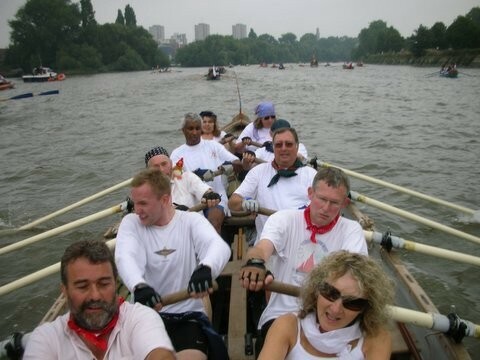 1-day Row & Sail to Cowes for lunch and back. Arrive Calshot 09:00.. Back at Calshot by 15:30? (HT Portsmouth 08:49. Sunset 16:06). 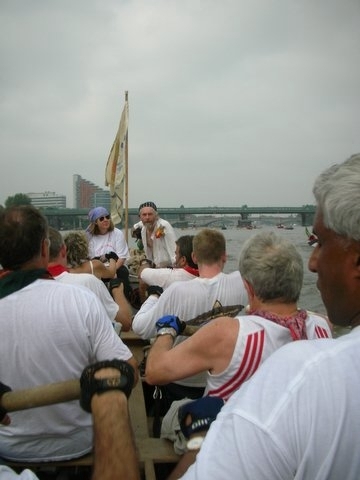 Previous visits, 2015, 2012, 2011, 2010, 2009, 2008, (2006 was Rye Rum Race), 2005. 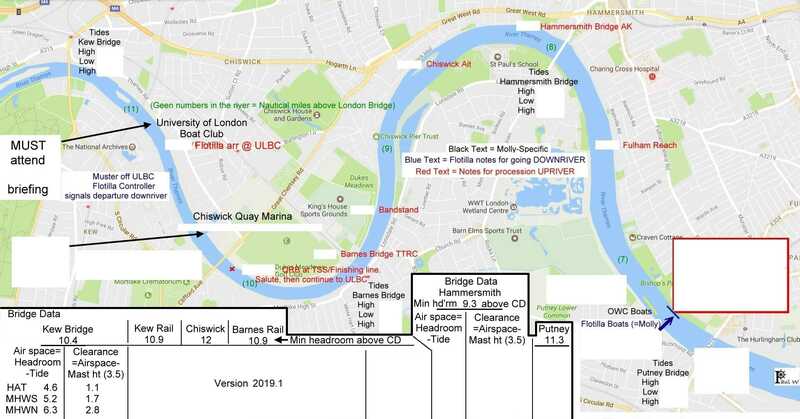 Sunday 7th March 2019- The University Boat Race - In Flotilla accompanying Royal Barge "Gloriana". PW's Map of the route. (Blank spaces for timings, tides, bridge heights, etc). PW's Map of the route. Monday, 27th May- Sun 2nd June 2019 - La Semaine Du Golfe du Morbihan - (our 2017 web page). Organisers' website. Brilliant tidal sailing mainly in enclosed bay with islands and creeks. Masses of traditional sailing boats from three-masted tall ships to small dingies. An excellent week! Molly is in Flotilla 3b, Traditional Leisure boats & Open boats. (Flotilla 2 is Sail & Oar) Previous visits 2017, 2O15, 2013, 2011, 2009. [TBC] June, 21st June or Wednesday 19th - (Suggestion) - Summer Solstice Soiree. Sunset picnic afloat on the longest day of the year. Sat July 27th - Fri Aug 2nd 2019 - Cowes Classics - (Their website) Previous visits. None. July / August / September? - "Mazurian Magic" / "Sail Mazuria" - A non-Molly event. Locally charter one or two shallow-draft sleep-aboard boats for a week. See our page "Sail the Great Lakes of Mazuria"- Inland, non-tidal sailing in "The Land of a Thousand Lakes" - "a genuine paradise for sailing enthusiasts". Date Summer 2019, depending on availability of those interested. Contact PW. "English Raid" - 2019 - Returns to Scotland! - Monday 22 – Saturday 27 July - Details at their website. Previous English Raids - 2017, 2016, 2015, 2014, 2013, 2012, 2011, 2010 (password Molly) & here. DORESTAD RAID - Wednesday 18th - Sunday 22nd September 2019. Our 2019 page. - Dutch page - And their Presentation. Hotel barge moves to each night stop. E250 pp sleeping on your own boat or E300 pp sleeping on hotel barge "In Dubio" all inclusive. (2018 rates). 2918 Three Henley Whalers attended with SM's "Llafurio". 2017 Three Henley Whalers attended with SM's "Llafurio". 2016 Four Henley Whalers attended with SM's "Llafurio". Click for pics (bottom of page). 2010 - With "Molly" - Some pictures from CB here. October 2019 - Whalers' Annual Long Row - 2-day weekend, plus launching. - Venue and date TBC. - 2018 nfo here. Previous Long Rows - 2017, 2016, 2015, 2014, 2013, 2012, 2011, 2010. 2009. December - Boxing Day - Annual Mince-Pie Meet on Mill Meadows. (Past events - 2013, 2011, 2010, & others). Typically Calshot 08:45. Cast off 10:00. Row to Lunch in Cowes. Sail back. At Calshot by 15:30. Some items which seem to have fallen off our agenda, or which are not annual. 2018 May, 20th - 27th - Venice:-. Tuesday 22nd - Saturday 29th - Vela Raid. Sunday 27th - Velalonga. Previous visits. 11th - 18th June 2016 - Milford Haven .SeaFairHaven. Previous visit - 2013 . Wed 13th - Tues 19th July 2016 - Brest Website . Previous visit 2012. 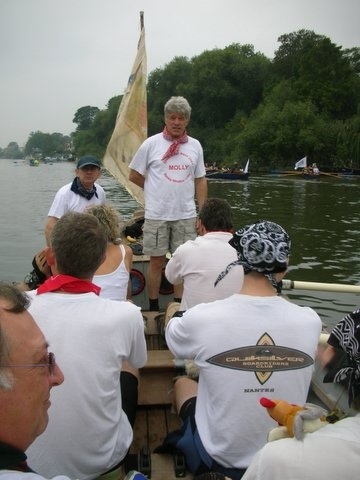 Monday 24th August - Source to Sea Relay 2015 - Hambleden to Temple. Previous S2S relays. 2015, 2014, 2013. July - The Eddystone Challenge - Try this link or this-or this - Row Round The Eddystone light! An incredibly arduous (and rather boring?) row! June 2013. - Elbe Expedition, by Willem Leopold - Desden to Magdburg. - "Elbe Expedition" page . No whalers attended. June 28th OGA Cardiff Bay cruise up-channel. A land and water-based event with a River/Estuary Raid centered on La Roche Bernard river. This would be our first at this event. Henley Whalers prefer to go to Venice. Here is some pre-departure stuff from previous years, about getting there, the area, the weather, accommodation, etc. 2018- July 25th - 29th - Douarnenez - (Their website) Previous visits. 2016, 2014, 2012. 2018 - July 22nd - 28th - Cowes Classics - (Their website) Previous visits. None. 2018 July, 1st - 14th - "Fossil-Free in Friesland" - Our page in English - Some "Dorestad" Raiders + PW&IZM attending. Paid-up-Crew are included in our emailing list, "Whalernet". Contact Bob if you need help using it. Our forum for discussions The Henley Whalers Yahoo Group is now rarely used.